Al-kabir town is an alternative good option in raiwind road premises. Alkabir town phase 2 has launched one month ago and got overwhelming response from Bahria relators & investors. Alkabir town is running by Bahria town realtor and copying the same procedure in all aspects. Though Alkabir project scale is tiny comparatively but the major good thing is that speedy development, on ground plots ,attractive payment plans and dealers friendly. You can assume the development speed by this example ALkabir town phase 1 launched 8 months ago with three years payment plan but Alkabir management giving possession on this 14th august. 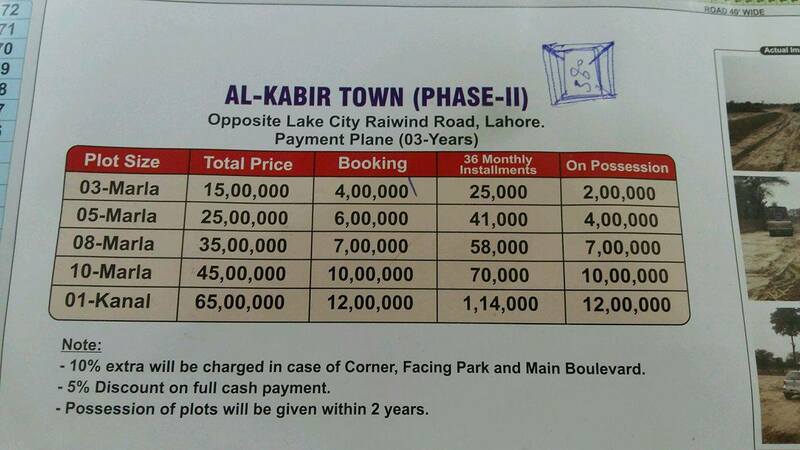 The prices are raised tremendously when all other Lahore real estate markets in depression. ALKabir town phase 2 has much better location to its previous project. It is located at 500 meter away from lake city and less than1 km away from Adda plot and ring road junction. The development work has started from last one week and management promise to complete development within six to eight months as done in phase 1. Why investment in kabir town ? The all positive external factors have directly impact on Alkabir town like ring road ,adda plot, raiwind road ( the most potential area for real estate investments). – Bahria realtors are doing trading and investment in this town. I m not saying the Alkabir town achieved the same success holding other renown housing societies like bahria town, lake city , etc. The main point to understand at this launching price in this location makes Alkabir town ample potential for investments. As you know i never cover other housing societies except bahria projects. But the thing to force me to write about Alkabir hype nowadays in dealers market of bahria town lahore. We have seen the market is in depression of all bahria town lahore project from last one year, In this depressed real estate market the AlKabir town has successfully done phase 1 and currently AlKabir town phase 2 is full swing in terms of trading and investment in bahria town lahore realtor market. There are open forms/ plots available in market, If you are looking for purchase so you have to give downpayment + own. Another important reasons for success of Alkabir so far. They given balloted plots not files at very economical price of down payment. Three marla is considering as the hot cake and development has also started from 3 mala and five marla area. The current own in 3 and 5 marla between ( 50,000 to 350,000) according to location. The majority of the plot in alkabir phase 2 consist of 3 and 5 marla so it also attract small investors especially 3 marla it is because 3 marla is now rare option in good societies. 8,10 and 1 kanal categories. In these categories 1 kanal will be super hot due to its location, Currently own in 1 kanal is 2lac to 4 lac own, The reason for less own now due to development has to be started in this category, Once the development will start in that area i guess 1 kanal own will touch minimum 1million. If we talk about 8 and 10 marla these category are not as attractive as others in term of trading especially 10 marla. It is available at level price. I highly recommend this society and assure you can definitely get good profit. It is because at this price, location, and all above noted positive features tell us that Alakbair has very much potential for investment. The matter of fact that if any one launch housing project at this location, price and develop timely in good faith then there is no reason of failure or unsuccessful. Another important point is need to mention, there is no uncertainty and no risk because they are offering plots and you can see development at sight. So Alkabir town is parallel investment opportunity against Bhaira orchard, Lake City and all other societies located at Raiwind Road and this is ground reality. For more info, sale and purchase you can contact me freely. Your comments are always welcome, Share your thoughts through comment box. Brother what is your opinion about New Lahore city platinum enclave files? What you think about it’s growth in upcoming years and also what you think that when they will be able to do its balloting? ALkabir sector E has also lanched 10 days and even market went more updward in exisiting blocks and upcoming E Block. Current price of sector E File 3 marla is 90k own for general and 150k for location. both phase 1 and 2 have not NOC from LDA or approved authorties. i visited the office in phase 1. i really surprise the phase one is so small where they had hardley 50 plotes (3 and 5) marla. while by Law no socitey will approved by LDA if they have more then 200 kanal land at least. that is why when i asked by AL-kabir officleal to show me the NOC for both phase 1 and 2, first they try to avoide answer and at the end they gave me the excuse because the owner is not hear so we are not able to show you this. in phase 1 atleast they have 200 plus plots, they have got pre noc of phase 2. Similarly all bahria sector D to G are non approved and 60% exisiting developed bahria orchard too. Well current price of 3 marla and 5 marla own 3 to 5 lac. Mean you are at almost 100% profit. Bro what is the update of Bahria Paradise Karachi?? I am interested in 500 Sq Yard and 1000 Sq Yard..
Bahria town paradise map revealed yesterday, As per map i suggest you go for 500 sq yard. Currently you can purchase in minus. But society name sounds desi ..
Well there are so many english name societies exist in pakistan with zero performance. I have visited alkbir, I found it reasonable, i met some dealers at sight but they are demandind high price against you mentioned on your article. it was just demand if you are looking for purchase i can quote some best possible options. you can contact me as my number is noted in the end of this article. This is a really nice investment opportunity nowadays. yes it is and as they have a plan to expand then it will grow more further.